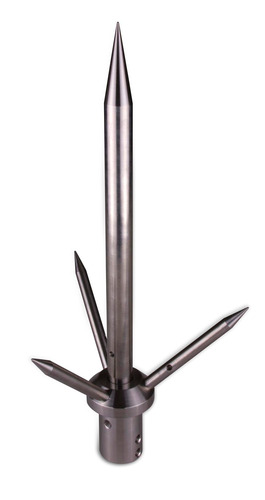 Lightning Arrestors are designed to provide protection to structures against physical damage from lightning strikes. They are critically placed on a structure and connected to a lightning conductor and earthing system to safely receive a strike, safely conduct the lightning current to the earthing system and safely dissipate it in the earth. Pragati Electrocom offers wide choice of devices suitable for different application viz. 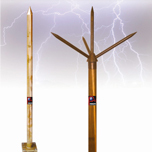 Traditional Lightning Protection (Franklin Rod); proactive interception of lightning strikes at early stages (ESE Terminal) and reducing the probability of a strike (Charge Dissipation Terminal). These are metal rods installed over a structure at preferred points for a lightning strike. These terminals are connected to a network of horizontal and vertical conductors that are terminated to earthing terminals. The network of rods, conductors and earth terminals covers the protected structure in a Faraday Cage. Various sizes and shapes of Franklin Rods are available to suit an application and we have capability to design and manufacture a custom system to fit your needs. 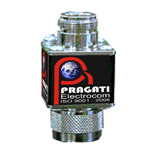 Pragati Electrocom offers Early Streamer Emission Terminals for structural lightning protection. ESE utilizes advanced streamer generating design elements to provide lightning protection to facilities that would otherwise be difficult or cost prohibitive to protect by conventional means. It is externally mounted, proactive, structural lightning protection device and is designed to activate itself in the moments directly preceding an eminent direct strike. 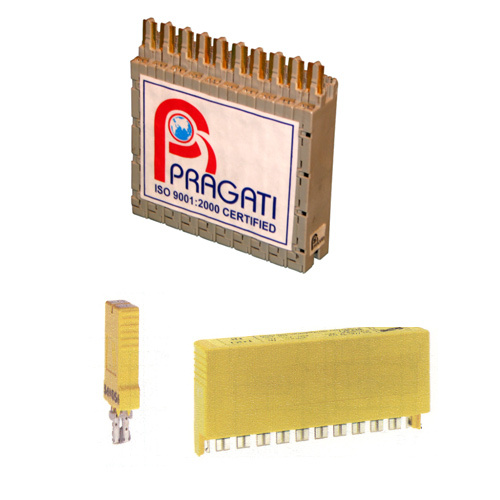 Pragati ESE terminal is scientifically designed and rigorously tested to provide exceptional performance, durability and long service life. The counter displays the number of lightning strikes that have hit the system. The counter is for use on tower legs or other down conductors such as cables. It connects two points on the conductor, spaced atleast 8 feet apart, using 25 Sq. mm insulated wire. Mounts on any flat surface. Based on Charge Dissipation Principle, Technology uses the point discharge principle to facilitate the dissipation, or the reduction, of a buildup of static electrical charges. Science and experience show that the structures on which CDT are installed, are much less likely to sustain a direct lightning strike than unprotected structures or structures with traditional lightning protection systems. Various sizes and shapes of CDT are available to suit an application and we have capability to design and manufacture a custom system to fit your needs. Primary Lightning Protection System protects sensitive electronic equipment, functioning on high-density chips and PCB technology, against direct or indirect lightning currents. 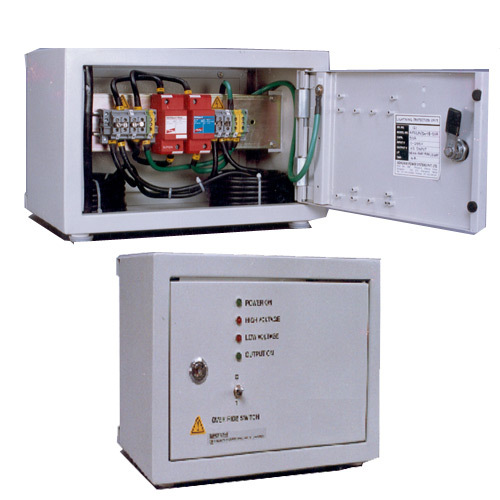 The protection system assembled in a wall-mounted box is connected to power line circuit of the installation at the building entry point. The primary lightning protection unit is a Class B protection device, operating on RADAX Technology is concealed between phase to neutral and neutral to earth and does not need any back-up fuse. These arresters in normal condition maintain high insulation state and get activated at 4kV threshold. The device offers multi strike protection even in the worst case of 10/350?s 100kA direct lightning. Secondary Power Protection System comprises of the Class C surge arresters rated for 8/20?s, 20kA multistrike. They permit let through voltage of ~700V as its output, at stage II. The surge protection has been designed using arresters, working on latest technology and capable of handling follow-on current upto 20kA under lightning / fault conditions. 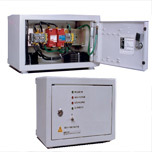 Single phase / Three phase units are available in desired current capacity. Plug-in surge arrestors for protecting communication network using line systems have been designed using insulation pierced connections with built in-fail safe- overload protection and surges up to 10 KA (average) at 8/20 microseconds. The device has been designed with four-stage protection extended with the combination of GD Tube, PTC, MOVs and Surge suppressor diodes. The devices are capable of operating in < 1 n sec. With operating temperature range of -25 C to +80C. Stage-I : The GD Tube placed across the line at the subscriber end, as well across the earth, small extend total protection between line to earth, return to earth, live to return path. The fuse installed at the Telephone Exchange side shall blow-off to protect the Exchange. Stage-II : The combination of two PTC's and three MOVs shall protect the Telephone Exchange in case of surge on the line if GD Tube fails to function, on all three routes i.e. line to earth, return to earth, and line to return path. Stage-III : In case of non-functioning of first two stages the surge suppressor diode (Clamp Diode) shall clamp the surge signals resulting in the fuse blow-off thus extending protection to Telephone Exchange. Stage-IV : The PTC is provided prior to MOV to create line impedance for safeguard of the MOV from blast in case of surges. The coordination coil before the surge suppressor diode, provide line impedance for safeguard of suppressor diode. The LED in CCT indicates the healthy and proper polarity of the line. In case of short CCT at subscriber end, sufficient line impedance is maintained with the help of PTC and coordination coil for over-load protection of Telephone Exchange. Technically the GD Tube, MOV's and Surge Suppressor Diodes are voltage protection devices and PTC and Coordination Coil are current protection devices. Plug-in surge arrestors for protecting communication network using line systems, have been designed using insulation pierced connections with built in-fail safe- overload protection and surges up to 10 KA (average) at 8/20 microseconds. All the receivers and emitters of radio signals are very sensitive to surge voltages since they are highly electronic equipments. A typical weak point of these devices is the input of the coax cable, which may become the conductor for the surge voltage. Both radio and TV antennas are very exposed to receive the effects of surge voltages from atmospheric origin since they are located in the highest parts of buildings or structures. The surge voltages can be conducted by a direct strike of lightning to the antenna or the electro-magnetic field when lightning strikes in the proximities can induce them. 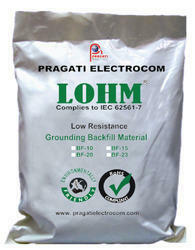 LOHM is an advanced backfill compound, which lowers the contact resistance of the earth electrode to earth by over 60%. It produces low impedance to surges resulting in faster transient dissipation. It is RoHS compliant and has excellent shelf life. It performs in all soil conditions even during dry weather, does not depend on continuous presence of water, requires no maintenance and does not adversely affect soil or ground water. 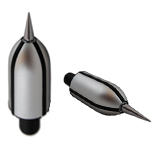 It is available in easily transportable 10/ 25 Kg. bags. Resistivity of chemical is less than 0.1 ohm-m. Earth resistance remains same over wide temperature variation range viz - 60° to + 60°. 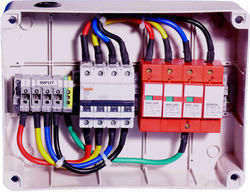 We deal n Lightning protection and Surge protection..